As many of you know, I’m a big fan of the canon Tenchi Muyo! franchise but I’ve also enjoyed the various non-canon spinoffs for what they are worth. The latest spinoff is Sasami: Magic Girl Club (as the official English naming goes). 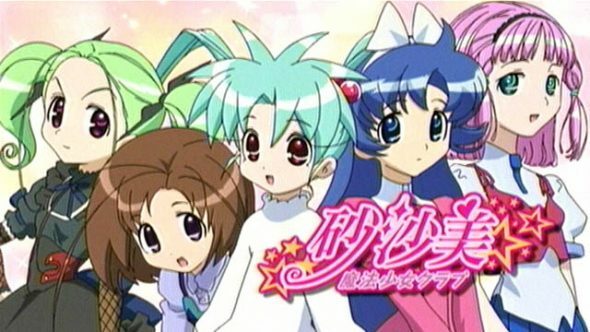 While it does take the characters of Sasami, Mihoshi, Washu, and Ryo-ohki from the TM!R series, it also pulls Misao from Magical Girl Pretty Sammy as well. I’ve yet to see the series (save for a brief look at the first couple of episodes in Japanese and the first four episodes in English) or its sequel, but I am keen to do so. Despite not being one to watch English dubs, when the Tenchi Brand Manager contacted me about interviewing English dub director Leah Clark, there was no way I was saying no. So, I did a brief interview with her (which will also be published on the Tenchi Muyo! FAQ site and I believe FUNimation’s MySpace page as well). I’d like to thank Leah & Amber for setting this up. I’d also like to apologize for this being a weaker interview on my part (I’ve done several interviews with comic strip artists) but my lack of knowledge of the dub side of anime fandom was a real limiting factor. ? That said, here’s the interview. AstroNerdBoy: As you know, the Japanese decided to choose inexperienced young girls to provide the voices of Sasami and friends. Did you ever consider using child voice actors? Leah Clark: Not at all. ANB: What ultimately lead to the decision not to use children? LC: Flap-matching mostly. It’s very difficult for an adult who is already a professional actor in other areas to get accustomed to matching mouth flaps. It would be absolute hell on a child. They’d hate me and never voice act ever again. Now, during the second season, I did try to cast younger actors for the members of the Shining Team since the roles weren’t as demanding. I auditioned several younger girls (young teens mostly) and ended up with one new-comer, Gina Circelli-who plays Chinako (it’s her first role at Funimation) and Jad Saxton who plays Eimi. Not that the other girls weren’t talented, but voice-dubbing is very much a skill-based job. I also wrote the English script and I wanted to capture the humor that was intended for the show (judging by the animation) and I needed strong actors in the five main roles who could match flaps with brilliant comedic timing and emotional range. Hard for actual fifth grade actors to do that. ANB: When directing the voice actors who were playing Sasami and friends, did the fact that the Japanese used actual children influence how you directed those voice actors? LC: Well, it was more the fact that the characters were children. There were times when Cherami Leigh (who plays Makoto) would accidently stumble over her words and as long as we could still understand what she was saying, I would leave it in since children of 9 and 10 years of age don’t typically have the best diction. Same went for Gina Circelli, Monica Rial (Misao), Majken Bullard (Kozue), and Alison Viktorin (Sasami). I felt that Anri and Tsukasa should be a little more mature sounding in their diction since Tsukasa is sophisticated and Anri is in 6th grade and constantly trying to impress Tsukasa. So Brittney and Brina are consistently clear. Writing it was where I made most of the child-like choices, though. They use words like “bestest” and “yes-huh,” and their grammar is immature. If their lines sound more mature, I made sure the line delivery was like that of a child who heard an adult use that phrase once. I taught an after-school theater class to children of Sasami n’ friends’ ages, so I made sure all the lines could’ve easily been said by one of my students. Kids can have some pretty impressive and mature thoughts so nothing is completely dumbed down… but it’s the way that they say it that distinguishes them from adults. I also wanted the opening and closing theme songs for the first season to be very young sounding like in the Japanese. Lauren Claire Poitevant and Laura Wetsel are two talented young girls from Casa Manana, a professional children’s theater here in town. Lauren Claire is 16 and Laura is 18. The music was all directed by Brina Palencia with the exception of the opening theme song which was directed by Mike McFarland. Brina wrote all of the English lyrics. She rocks socks, like whoa. ANB: One thing I noticed in the first four episodes was some name mispronunciations. Two immediately off the top of my head were Sasami, which was pronouncing “Sa-su-mi” and Ryo-ohki, who was addressed as “Roy-ohki.” Was this a deliberate decision to use these new pronunciations? If so, what was the reason for it? LC: I think the original dub pronounced Sasami’s name Su-sah-mi, which is wrong. Japanese emphasize the first syllable always. So Sa-suh-mi is correct. Ryo-ohki we pronounced “Roy-oh-kee” because that’s how it sounded in Japanese. ANB: How much were you aware of the “Tenchi” franchise before coming into this latest spinoff series? LC: I actually wasn’t aware of it when I first became acquainted with the show. I was first assigned to write the show and after writing the first two episodes and falling in love with the characters, I asked to direct it. It wasn’t until then that I did extensive research on the show and learned that it was a spin-off. I then watched some old episodes of Tenchi to see where it fit in. It doesn’t really seem to… except that some characters are the same and there are some minor parallels. LC: I would strongly encourage them to watch it as a separate treasure. Spinoff doesn’t mean “sequel.” Melrose Place was considered a “spinoff” of 90210 only because Jenny Garth’s character was in it for the first few episodes. Other than that, they don’t have much to do with each other. And come on, Melrose was so much better—hello. Just think of it as a new awesome show that some of your favorite “actors” (Washu, Sasami, Ryo-oki, Mihoshi etc) are in. Sasami is a teenager in Tenchi. In Magical Girls Club, she’s 10 years old. So she’s not going to be exactly the same. She is just as lovable though—maybe more so. She’s what I thought she might be like as a child. In that same respect, Washu is a little younger and a little more feisty and fabulous. Mihoshi is a school teacher. I think it’s exactly what you would picture her to be like in that situation… though she never would be in Tenchi. ANB: What was the one thing about “Sasami” that appealed to you as a director? LC: The characters—OMG! I LOOOVE these characters. They’re each so endearing and distinctive and tangible. You can’t watch it and not find your absolute favorite—at least, that was one of my goals. The actors did such a good job at interpreting them. As a writer, I really wanted to do them justice. I wanted to make them as believable as possible. I wanted people to truly care about them. I feel so maternal towards these characters. They’re my “girls.” Character development is very important to me as a director (and as a writer). The Japanese have already done the rest for me. I couldn’t have asked for better characters or more perfect actors to help bring them to life… like, EVER! I call BS on Leah’s remarks on how the Japanese sounds or is spoken. Well, I didn’t challenge her on that aspect. I did re-listen to how Sasami and Ryo-ohki’s names are stated in the Japanese in the first episode and I don’t hear what she hears. I’m not sure how many dub people will actually care about that though. I’m really disappointed that the original dub voices for Sasami, Washu, Ryo-Ohki, and Mihoshi aren’t going to be in the new dub. I really assumed that since they got most of them back in that wretched new OAV series they’d get them back for this thing. Seriously, Funimation, either do it all the way or spend the money on something better…Their dub of One Piece’s “We Are” was vastly inferior to just about every other dub song they’ve done. The lyrics didn’t rhyme or flow naturally at all. You know, I should have asked about the original dub voices vs. the new. That said, even on the Japanese audio, there are all-new seiyuu for the voices of Sasami and the others (Sasami being voiced by a young girl). As such, I suspect that FUNimation took the tact that if the Japanese didn’t use the original seiyuu, FUNimation didn’t need to use the original dub VA’s. You know what? You have a point there, AstroNerdBoy. Although, I must say, I’m surprised that the Japanese got a new voice cast for Mihoshi and Washu. I’ve been waiting for this series to get an American release for a while now. I just made the mistake of assuming there’d be some VA continuity. But I really love Funi’s group of voice actors and it will be interesting to hear Luci Christian’s interpretation of everyone’s favorite “greatest genius of the universe”. So, yeah, people….go rent/buy it! How did you feel when she said she “wasn’t aware of” the Tenchi franchise as a whole while she was already working on this project? Speaking for myself, I would think that that reveals a fairly embarrassing oversight/apathy on both her part and Funimation’s. I guess that didn’t surprise me. Why? Well, there are a lot of people who’ve never seen TM!R or any of the spinoffs (I should have asked about Pretty Sammy though). Now, had this been a canon Tenchi title or even a direct sequel to one of the established spinoffs, then I would have had trouble her not knowing Tenchi and I would have made a follow-up question. What bothered me most (and I let it slide) is what an earlier commenter stated about the Japanese. The English pronunciations of some of the names are wrong, but that’s not uncommon and I rarely hear anyone complain who what English dubs. ^_^; Her saying that the original English dubs were wrong in how they pronounces “Sasami” is wrong IMO (they had it right). But oh well. *nod nod* That’s…a fair and reasonable response. Maybe I got ahead of myself. I agree on the pronunciations bit, though. In the end, thanks for the awesome interview, and I look forward to catching some episodes soon.! Glad you liked it. I hope to have another interview soon that’s partially Tenchi-related. Also, I hope to have an early review of Sasami but we’ll see if that comes through or not. You know though, as someone who has been a fan of the Tenchi franchise since its beginning, I just happened upon this DVD at the store, and bought it mainly for my little girl, and with the quality Funimation usually puts into their dubs, I have to say I just CAN NOT BELIEVE the mis-pronunciation of two major characters with such a LONG history! Funimation: if you are going to sell this on the box as “A Spin-off to Tenchi..” then at least have some respect for these beloved characters and do a little research and pronounce the characters names RIGHT! Yes I agree this isnt a canon series, but if you do a Charlie Brown spin-off and dont call it “Peanuts”, are you going to have Marcy call the main character “Churles” instead of Charles?? (cant resist the Charles in Charge joke for those of you old enough to relate). C’mon Leah: Funimation got the rights to the last OVA, and YOU are not aware of the characters until AFTER you start this project, or doing any research into the heritage of the franchise?? And its a shame cause while I can agree only people familiar with the characters prior to this would be distracted by it, this is just pure sloppiness on what otherwise is a cute series – and besides: for the most part, wouldnt only people familiar with Tenchi be buying this in the first place? If not – why even point out on the box that its a “spin-off”??? DUH!!! !